Belle Pauling with her infant son, Linus. 1901. We begin the story of Lucy Isabelle Pauling, Linus Pauling’s mother, with Linus Wilson Darling, Belle’s father and Linus Pauling’s maternal grandfather. In 1863, Linus Wilson Darling’s father abandoned his family in Collingwood, Ontario, leaving his wife to struggle financially on her own. As a result, she sent her four eldest children, including Linus, to a foster home in New Jersey. When he was fifteen, Linus ran away from this home and made his way to Chicago, where he both worked and lived in a bakery. From there, he set out west, eventually settling near Salem, Oregon, and began teaching high school. One of his students was Alcy Delilah Neal. The two began courting and were married in 1878. As they moved around Oregon, looking for a place to settle, they began having children. Their second daughter, Lucy Isabelle “Belle” Darling was born on April 13, 1881, while the family was living in Lonerock, a tiny town in eastern Oregon. The family had arrived on hard times there and were, in fact, facing starvation. But they were saved when Linus bet his saddle against fifty dollars on Grover Cleveland to win the upcoming presidential election over James G. Blaine. Funded by those winnings, they moved twenty miles northwest, to Condon, where Linus opened up the town’s first general store selling patent medicines and running the post office – enough to keep him a busy man. Three years after moving to Condon, when Belle was seven, her mother Alcy gave birth to a stillborn son. Badly injured by the traumatic birthing process, Alcy also passed away, one month later. Linus however continued to lead a busy life. As he began to study law he occasionally hired a woman to help take care of the household, but mostly left it up to his four daughters – Goldie, Belle, Lucile and Abigail, all born in a span of five years – whom he called the “Four Queens.” (A fifth queen, Florence, was at the time too young to pitch in.) The bulk of this work often defaulted to the oldest daughter, Goldie. Linus eventually remarried, finding a younger widow who owned a large wheat farm and an extra ten thousand dollars to her name. This new-found financial support allowed Linus to become a gentleman farmer and begin his law practice. 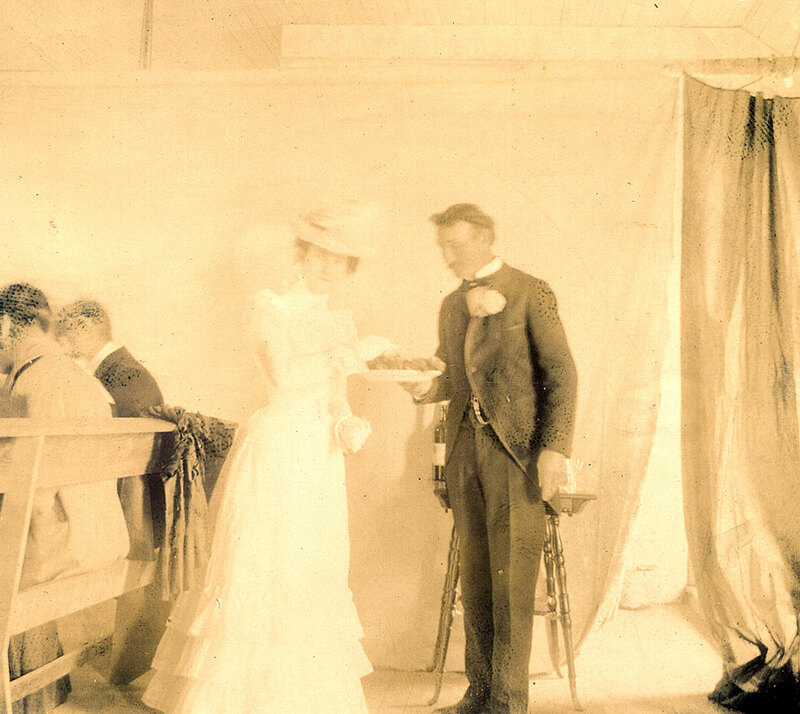 Belle Darling posing with her father on her wedding day, 1900. For Belle, this period was one of contrasts. Her mother gone, the household responsibilities mounting, and her father mostly a distant man, she began suffering from bouts of depression. On the other hand, her new family’s wealth and large home made her one of the Condon elite as a teenager. Indeed, the family resources offered some measure of protection from the economic depression plaguing the country, and the family was occasionally able to take shopping trips to Portland for dresses and other fineries unavailable in the small farming town. In 1895, Belle and Goldie also took advantage of the opportunity to attend boarding school at Pacific University in Forest Grove, Oregon. Belle did fairly well academically, earning marks of 85 in Bible, 91 in grammar, and 98 in arithmetic. But she did not enjoy the boarding school experience and came back to Condon after her first term. Her older sister, Goldie, was able to make it through the rest of the year before coming home. Returned to Condon, Belle slipped anew into her role as one of the town’s elite young women. One day, in the fall of 1899, Goldie invited the seventeen-year-old Belle over to her home, to meet Condon’s new druggist, Herman Pauling. Herman quickly earned the respect of the town and was the guest of honor at several dinners and dances. At these events, he and Belle often ended up talking with one other. The more time they spent together, the closer the two became, and by Christmas of the same year, they were engaged to be married the following May. Their lavish wedding was attended by nearly the whole town. The fairy tale ended quickly, however, when Herman was forced to look for work: the investors backing his Condon pharmacy had pulled out, forcing Herman to search for a new job. Since the Condon area was not big enough to support Herman on its own, he and Belle moved to Portland, finding a residence near Chinatown. 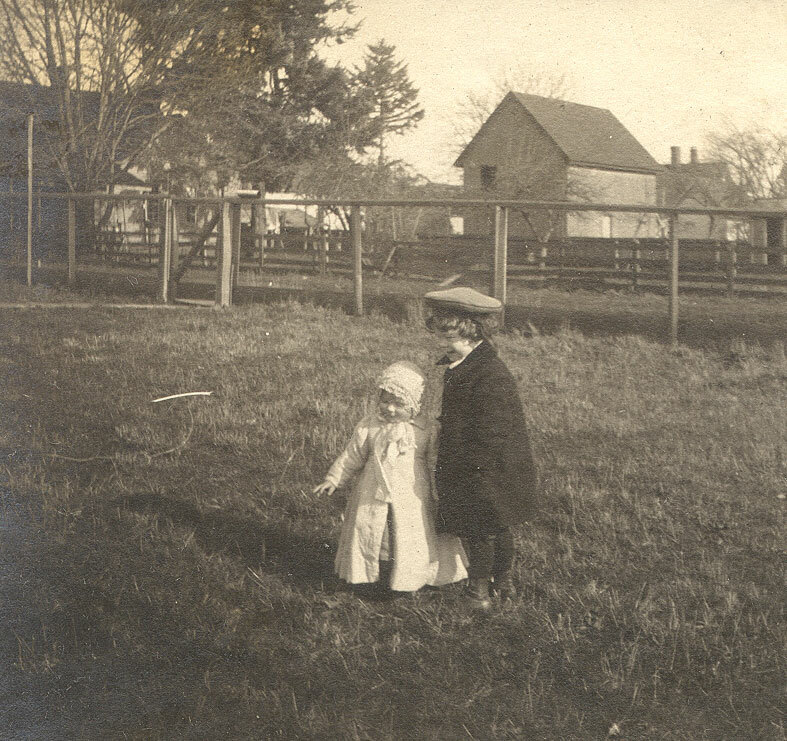 Linus Pauling with his sister Pauline, 1904. Belle was eager to take advantage of the entertainment and shopping possibilities that had once only been accessible following a long trip from Condon. Yet she was pregnant before she and Herman had left Condon and on February 28, 1901, she gave birth to their first child, Linus, named for Belle’s father. Soon after the birth, Belle took Linus back to Condon to visit her family. While there, they both came down with an illness, but quickly recovered and were back in Portland by May. Linus was quickly followed by his first sister, Pauline, born in August 1902. 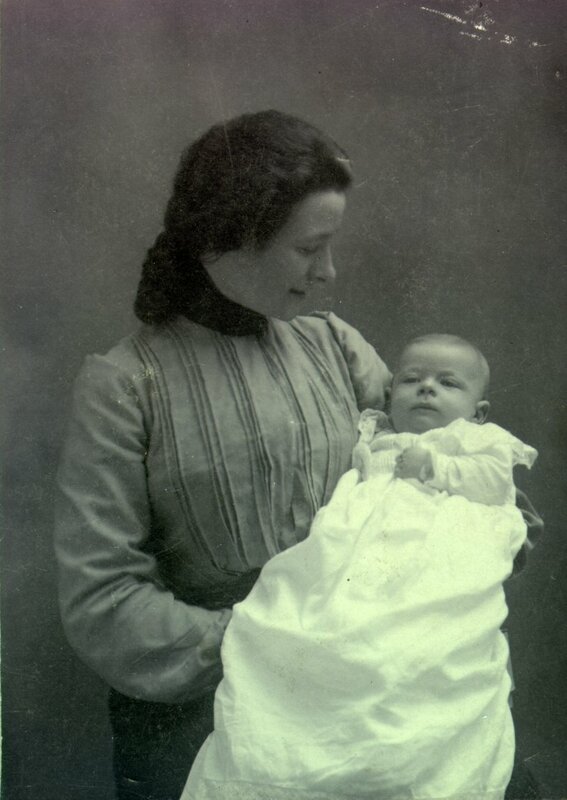 Frances Lucile (or “Lucie,” named after one of Belle’s favorite poems by Owen Meredith) arrived on New Year’s Day 1904. When Herman found a job as a traveling salesman, Belle was frequently left alone to care for the children. Her unquenched desire to enjoy the city, her absent husband, and her mounting responsibilities as a parent all combined to engender a growing resentment. Frustrated, she repeatedly wrote to her husband while he was on the road, admonishing him for not making enough money and spending so little time at home. Herman usually responded that he was doing all that he could to provide for Belle and the children, and that their future as a family would be brighter. In 1904, attempting to arrive at this brighter future, Herman took a new job – one that still required travel but was based in Salem. His hope was that doing so would give him more time at home since Salem was more centrally located in the Willamette Valley. The job did not last long though, and Herman was soon searching for new opportunities. Once again, the family turned to old territory: Condon seemed promising as Herman could open up his own store there with the help of Goldie’s husband. And so it was that, in April of 1905, with Herman already ahead of them, Belle packed up the remainder of their belongings and moved with the children to her old hometown. 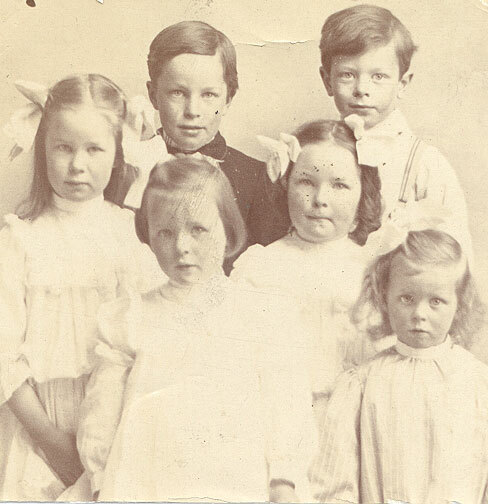 A group photo including the Pauling children: Pauline (front row left), Lucile (front row right) and Linus (back row right). 1906. The Paulings’ new home was above the general store that belonged to Goldie’s husband, Herbert Stephenson. Here, little Linus was free to roam around the town, while Belle stayed at home looking after her daughters. During the harvest period, Belle would also help at the Stephenson wheat farm by cooking for all the temporary workers brought in to process the grain. Moving to Condon meant that Herman was always close by and that he made a good income, albeit with a brief interlude of lean times caused by yet another national financial depression. Condon was able to bounce back due to its rising population of homesteaders taking advantage of the free 320 acres being offered by the federal government, a boon that combined nicely with a run of increased wheat harvests and the addition of a Northern Pacific rail spur. Nonetheless, Belle was not happy in Condon: Herman was still working over twelve hours a day, she missed the culture and excitement of Portland, and the summers were unbearably hot. The latter two issues were solved, at least in part, by annual summer trips to the milder Portland suburb of Oswego, where Belle and the children stayed with Herman’s parents. 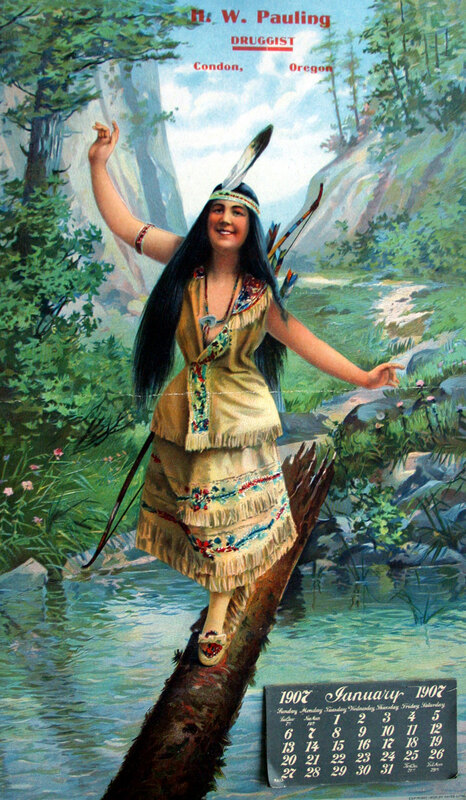 While visiting Oswego in the summertime allowed Belle to take in events like the centenary celebration of the Lewis and Clark expedition, she did not like being away from Herman. Letters to her husband sent during this period are full of anxiety over Herman’s fidelity and the family’s financial situation. By the end of the summer of 1909, Belle had convinced Herman that the family should move back to Portland, though Herman did not need too much convincing on his part, as he was also ready to leave behind the heat and petty small town politics. The family moved to East Portland, where Herman opened up another drugstore in a fast-growing neighborhood. Again he worked long hours, leaving Belle to take care of the children. But Belle also took advantage of being back in Portland by enrolling in German classes at a nearby high school. Since Herman’s business was slow to start, he used his free time to study German as well, providing Belle and Herman with a rare leisure pursuit that they could share as a couple. The happy times were not destined to last. In April 1910, the dark clouds began to gather when Belle’s father passed away. While Belle had never been particularly close with her dad, his passing was still difficult for her. Three months later, Belle, her sisters, and their children were attending the Rose Festival in Portland and when they returned they found Herman at home in tremendous pain. Herman’s stomach aches, the result of an ulcer, were a recurrent issue for him, but they had never struck so severely. The attack, as it turned out, was fatal – he died soon after they returned. Belle was emotionally devastated, financially imperiled and, widowed with three children, staring at a very uncertain future. 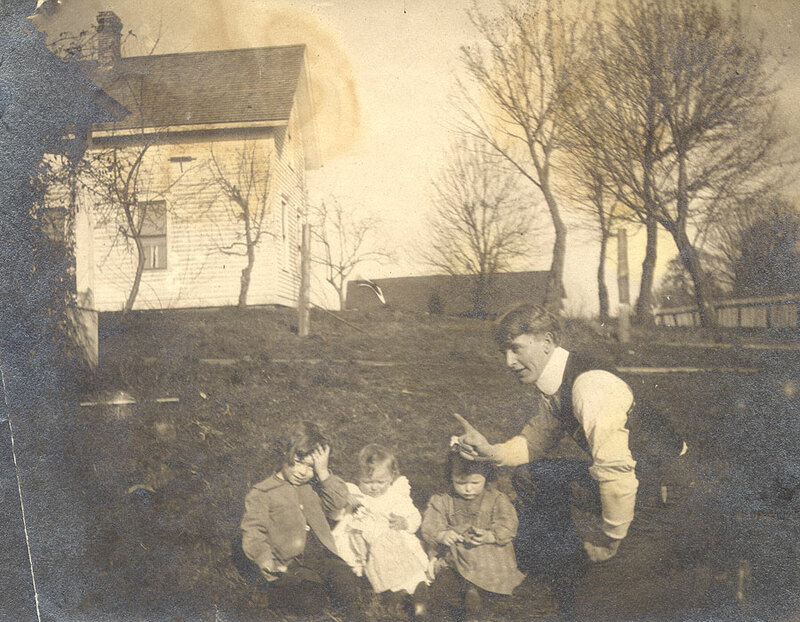 Herman Pauling with his three children in Salem, Oregon, where the family briefly lived. 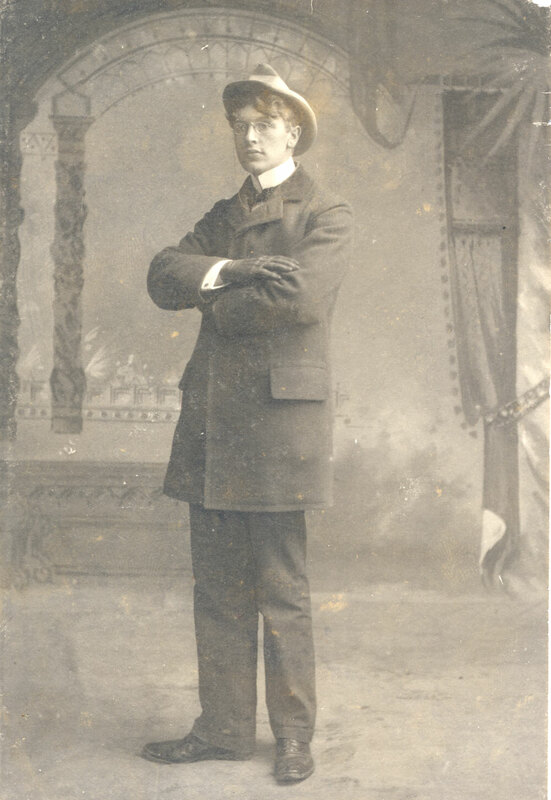 His family settled in Salem but not happy about it, it did not take long for Herman Pauling to look for new employment opportunitiess, and in March 1905 he traveled to Portland to explore the possibility of opening a drugstore. 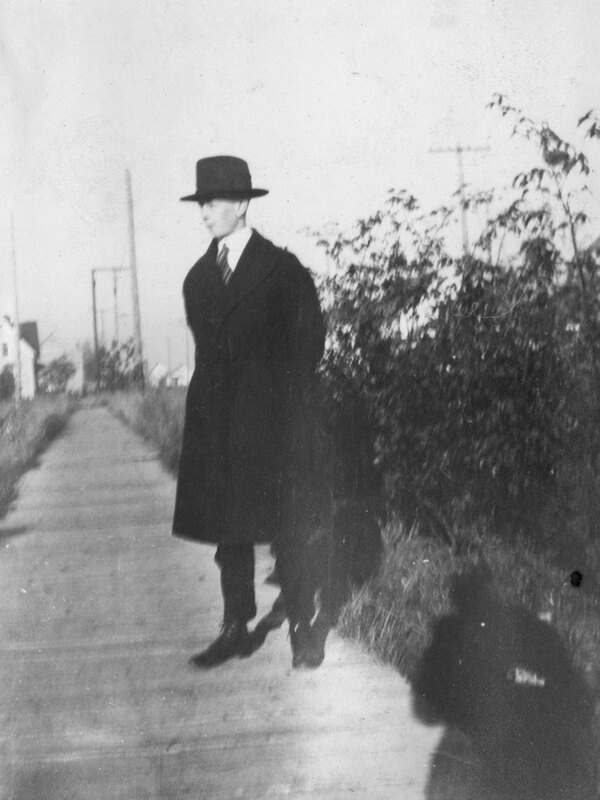 After visiting the Skidmore Drug Company, his old employer, and deciding that Portland was not going to work out, Herman once again set his sights on Condon. We cannot imagine what it is but I feel that either ourselves or our children will someday stand before the world as a specimen of a high standard of intelligence. Linus Pauling, a Condon Cowboy at age 5. Condon brought its challenges as well. The summer heat was hard on Herman and Belle too had also grown accustomed to the milder summer of the Willamette Valley. To escape the heat, Belle and the children would travel to Oswego for long stays with Herman’s parents, while Herman himself stayed behind to manage the store. By his second summer in Condon, Herman began conjuring up ideas for how he could get out of eastern Oregon, but it took a few years and more struggles before that would come to pass. Promotional calendar offered by H.W. Pauling, druggist. 1907. The financial panic of 1907 reached out from Wall Street to all corners of the country, including Condon, and it made a negative impact on Herman’s business. To help shore up his income, Herman partnered with a jeweler who promptly died the following year, leaving Herman to take over his role while also expanding into other areas, like selling eyeglasses. Herman’s associations through his many fellowship organizations, including Woodmen of the World and the Odd Fellows, helped to keep the drugstore profitable both through and after the panic, but staying afloat did not come easy. Combined with his continuing need to engage in business travel, Herman’s long hours at work brought more and more pressure on his marriage. Belle was outspoken about her disappointment in Herman, while Herman tried to do what he could to keep their problems out of the range of the children. In one letter, Herman let out what he had been holding back. I have quite enough to worry me without asking you to peck, peck, peck at me. But I guess you cannot help it, as that blessing is characteristic of the Darling family… Were it not for trying to get a start financially so you and the little ones may live in an abbreviated form of luxury in later years, I would not stay in this God forsaken hole a moment. You have discouraged me so often in my efforts that I would think you would eventually come to a conclusion to encourage me a little by discontinuing your nonsensical jealousy. Ground down by the pressures of life, Herman’s health began to suffer. He developed insomnia and what he described as a “tummick ake,” a condition that would sometimes incapacitate him, leaving him bedridden. More often that not however, his stomach problems could be soothed simply by eating something. Armed with an easy method for treating his symptoms, he pushed along as best as he could. Though he was unable to spend much time with them, Herman adored his children and sought to be the best possible role model, always hoping that they would grow up to be “an asset to the human race.” He brought his son to work with him and Linus maintained memories of watching his father concoct various medicines, using careful measurements while also testing the compounds through various chemical reactions. Herman also looked after Linus, who could get into trouble when he was not at home or in his father’s store. One day Linus was exploring a building that was in the process of being constructed. One of the workmen saw him there and was angered. Linus tried to climb out the window, but the workman caught him before he could escape and ended up giving the young boy a beating. While most of the town appreciated Herman, some locals felt otherwise. After Herman had organized a Fourth of July celebration and run advertisements in the program for the day’s baseball game, the other jeweler in town wrote a letter to the editor of the Globe, attacking his competitor for his advertising tactics. Herman did not stand for this public affront and retaliated by writing a lengthy response, titled “The Truth Will Out,” that described how “Sorehead Charlie” was being unfair and that, in business, having enemies is helpful, but not at the cost of fair play. The exchange went on for several weeks until both sides eventually calmed down. As time passed, Herman and Belle became increasingly eager to get out of Condon. Herman did not like dealing with the recurrent diphtheria and whooping cough which a few of the area’s children. Belle, as had been the case since they first married, wanted Herman to work less, frequently complaining about his work schedule, which often ran to fourteen hours per day. In early 1909, the final catalyst for a move came about in an unexpected fashion, when Herman’s store caught fire. The local firefighters who responded to the blaze wound up causing even more damage by breaking the store’s front window and the glass figures that were on display. Badly shaken, Herman focused intently on relocating and, by the fall, had saved enough money to move his family to Portland. Back in the big city, Herman spent some time at the Skidmore Drug Company before opening up a new store on the growing east side of town. In Portland, Herman took a different approach and got out of most of the extra lines of merchandise that he had sold in Condon – jewelry, phonographs and the like. He did, however, add a soda fountain. But business was slow. Herman kept himself occupied by taking up German – Belle had been enrolled in classes at the local high school, and Herman thought it would be fun to join her as she learned. It was also something to make him look busy when customers came in. Herman likewise continued to encourage Linus’s growing curiosity by teaching him Latin to help supplement his budding interest in ancient civilizations. In May 1910, Herman also wrote to the editor of The Oregonian asking for advice about books to provide for his nine-year old son’s new interests. The editor responded by suggesting Plutarch, Herodotus, and Thomas Arnold’s The History of Rome. Sadly, Herman did not have much time to follow up on the suggestions. On June 11, while the rest of the family, along with Belle’s sisters, were at the Portland Rose Festival, Herman was back working when he started to get one of his stomach aches. He went home and ate some of the roast that Belle had prepared for dinner which, as usual, helped to settle his stomach and allowed him to return to the store. But the pain quickly returned and ferociously so. Herman collapsed and had to be carried home where he lay until his family arrived. After seeing his wife, son and daughters one last time, Herman soon passed away, leaving Belle to care for their three young children. He died at the age of 34, the victim of a perforated ulcer and attendant peritonitis. The son of German immigrants, Charles Henry “Carl” Pauling – Linus Pauling’s paternal grandfather – joined his father and brothers during the Civil War by enlisting in Company E of the 45th Regiment of the Missouri Volunteers. After the war, Carl met Adelheit Blanken, who had come to Missouri with her family from Germany. They settled in Concordia, Missouri, where they had four children: the youngest, Herman Henry William, was born in 1876. The following year, the family traveled to Biggs, California where they settled in a predominately German community. It was here where Herman’s sister, Anne Charlotte, was born. Herman and Anne would be the only two of Carl and Adelheit’s five children to survive into their twenties. In 1882 the Paulings moved again, this time to Oswego, Oregon, near Portland. Here Carl worked as an iron monger at the largest foundry west of the Rockies. It was likewise in Oswego that Herman began to attend grammar school. By the tenth grade, in 1890, he had grown tired of school and dropped out, talking his way into an apprenticeship with a local druggist instead. Condon drug store, early 1900s. In the late 19th century, medicine not well regulated, leaving the door open for basically anyone to come along and make whatever claims they wished concerning the efficacy of their products. The druggist with whom Herman apprenticed taught him to avoid making wild statements and instead instilled in him the importance of the druggist’s responsibility to his customers. This professional ethic was closely bound to the practice of careful preparation of extracts, compounds, ointments, tinctures, oils and other products. By his nineteenth birthday, after several years apprenticing, Herman felt confident enough to move to Portland, where he found work at one of the largest pharmacies in the city. The pharmacy, Skidmore Drug Company, employed Herman as a traveling salesman, his purview being a one-hundred mile area ringing Portland; he covered his turf by horse and buggy. After a financial depression hit the country in late 1893, Herman moved back to Oswego to run his own pharmacy. The depression led to the closing of Oswego’s massive foundry, pushing many to leave town, including the doctors and other druggists. Pretty soon Herman found that he was only person in town who could possibly care for the sick and his reputation quickly spread. The town was grateful for his skills and his caring disposition – as instilled by his mentor – in addition to the low fees that he charged for his consultations. If he was particularly concerned about them, Herman would commonly visit his patients well after their original appointment, making sure that their health had improved. 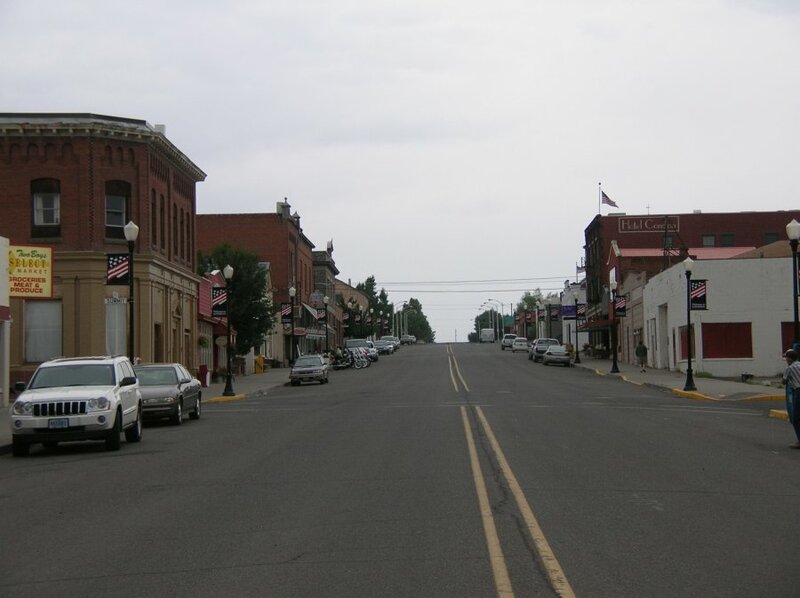 Herman’s reputation spread back to Portland as well, and investors there saw him as the perfect person to open up a drugstore in the small eastern Oregon town of Condon. By this time, regulations on drug sales had begun to increase, creating opportunities for those who were well-situated to meet the new standards and get in on the emerging market. Dear love, when life’s storms are raging fiercely I offer you my arms as your protection, and you can trust in their fond yet firm embrace. When in after years the cares of home and motherhood bear upon your mind you shall find me ever an able assistant and benefactor. A maiden fair with jet black hair/ Her heart beats kind and true/ She confides in me her every care/ This maid with eyes light blue. 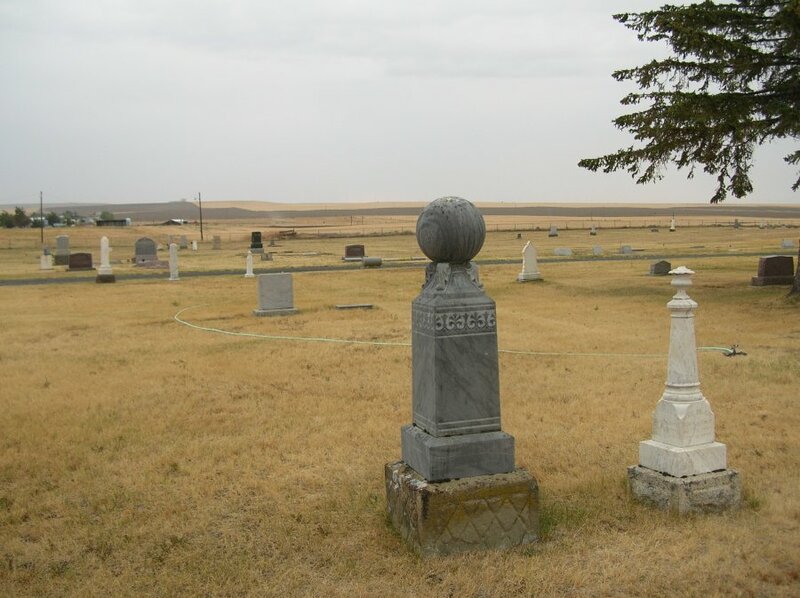 Herman and Belle married on May 27, 1900 at the Congregationalist Church in Condon. (Herman was raised as a Lutheran, but was quite willing to adapt to Belle’s Congregationalist upbringing.) Trouble struck quickly however as, only weeks after the wedding, the Portland investors that had backed Herman’s initial move to Condon pulled out of the venture, leaving Herman scrambling to look for a new job. Herman had to settle for a clerk’s position at a pharmacy in Portland and the newlyweds found a small apartment near Chinatown. 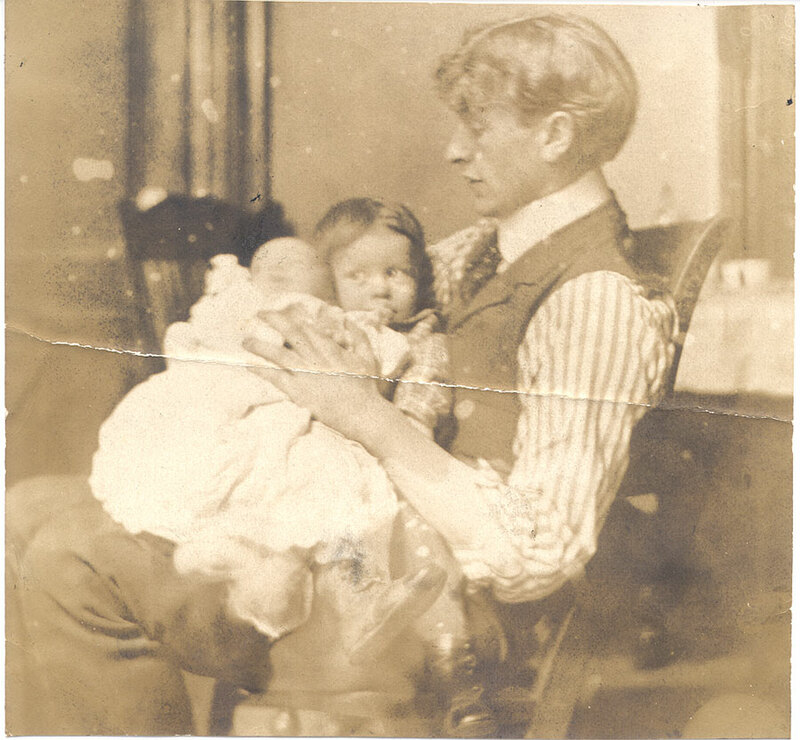 The young father with his infant daughter, Pauline, and slightly older son, Linus. 1903. Newly married, Herman worked as hard as he could to support his new bride. Meanwhile, the entertainment and shopping possibilities in Portland gave Belle new realms to explore that were unavailable in Condon. 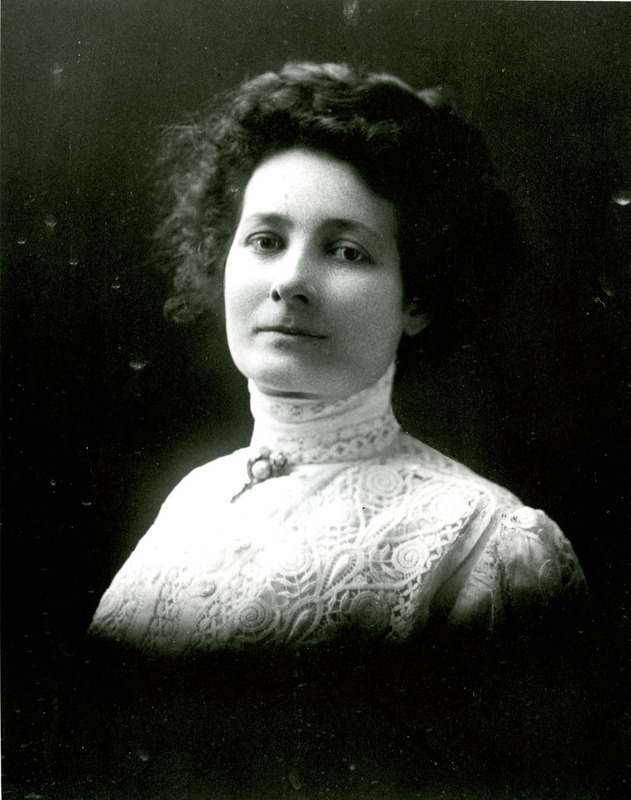 Belle was also pregnant when they arrived in Portland; Linus Carl Pauling, Belle and Herman’s first child, was born at the end of February 1901. Herman was thrilled to have a son and worked even harder to provide for his growing family. But this left Belle alone much of the time to take care of Linus on her own. Only nineteen years old, the young mother was still drawn to the possibilities of the city. But her feeling of being stuck with the children continued to grow as Pauline was born in August 1902, and Lucile on New Year’s Day 1904. When Herman was home, he would take Linus for walks around the neighborhood to try to wear out the energetic toddler. The two wandered through the shops and Herman’s charismatic little boy drew the attention of neighborhood merchants who taught Linus to count to one-hundred in Chinese, a talent that garnered a measure of celebrity for the little boy as he displayed his counting skills for passersby. Belle sometimes joined Herman and Linus on their walks, and the family often visited a nearby water fountain. Herman continued to look for a better job and eventually found one in Salem as a traveling salesman for the jeweler and druggist D. J. Fry. By October 1904, the family had moved into their new house in Salem. For his job, Herman traveled up and down the Willamette Valley, sometimes seventy miles in one day, still using a horse and buggy. With Herman away even more, Belle was left to care for the children in another new town, and she quickly made it known that she was not happy with their situation. In his correspondence with his wife, Herman’s replies are directed at a better future; one where he would own his own drugstore and could provide Belle with more luxury than she had thus far known in their married life. 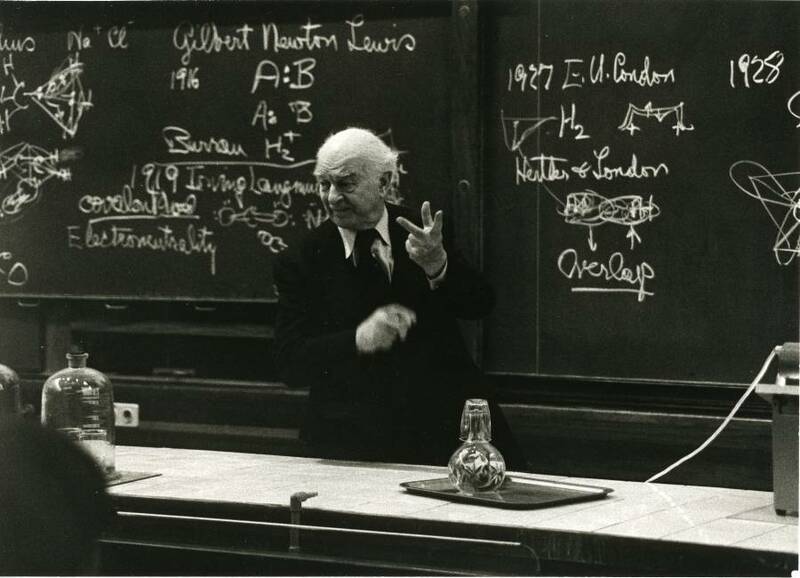 Linus Pauling. Lecturing at the Concepts of Chemical Bonding Seminar, Oslo University, Oslo, Norway. 1982. 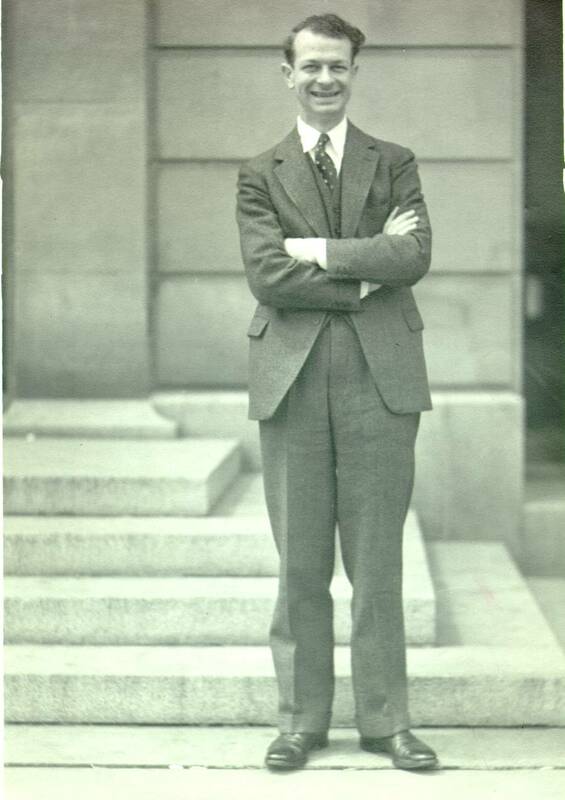 Today marks the 110th anniversary of Linus Pauling’s birth, which occurred in Portland, Oregon on February 28, 1901. As has become tradition on the Pauling Blog, we are celebrating this occasion by looking back at Pauling’s life in increments of twenty-five years. At the tender age of ten, young Linus was already at a crossroads in his life. First and foremost, his father Herman had died of a perforated ulcer the previous summer, thus throwing the Pauling family into something akin to chaos. 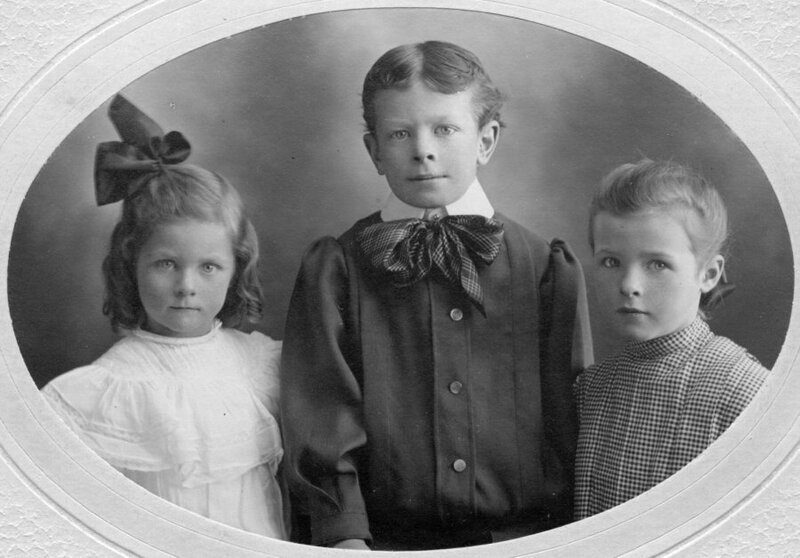 Herman was a pharmacist and businessman of middling success, and his death was a source of major financial concern for his widow Isabelle and their three children, Linus, Pauline (age 9) and Lucile (age 7). From this point on, Linus’s childhood was certainly informed, if not dominated, by the continual need to contribute to the household income. His mother’s only asset of consequence was the family home, which she boarded out on a regular basis in an attempt to make ends meet. But as time passed and Belle’s own health faded, her only son was frequently called upon to assist with the family finances, leading Linus to assume any number of odd jobs, from delivery boy to film projectionist to grocery clerk. It was at this same time that the boy’s interest in science was beginning to flower. The previous year Herman had written a letter to the Portland Oregonian newspaper indicating that his son was a “great reader” keenly interested in ancient history and the natural sciences. In 1911 Pauling’s scientific impulses continued to flourish in the form of an insect collection that he maintained and classified using books checked out from the Portland library. Not long after, as with many scientists of his generation, Linus would develop an interest in minerals and begin compiling a personal collection of classified stones that he found. By the age of thirty-five, Pauling had already established himself as among the world’s pre-eminent structural chemists and was well on his way to making a major impact in the biological sciences. In 1936 Pauling met Karl Landsteiner of the Rockefeller Institute, a Nobel laureate researcher best known at the time for having determined the existence of different blood types in human beings. In their initial meeting, Pauling and Landsteiner discussed Landsteiner’s program of research in immunology, a conversation that would lead to a fruitful collaboration between the two scientists. Importantly, his interactions with Landsteiner would lead Pauling to think about and publish important work on the specificity of serological reactions, in particular the relationship between antibodies and antigens in the human body. The year also bore witness to a major change at the California Institute of Technology: in June, Arthur Amos Noyes died. Noyes had served as chairman of the Caltech Chemistry Division for some twenty-seven years and was among the best known chemists of his era. His death ushered a power vacuum within the academic administration at Caltech, by then an emerging force in scientific research. Three of Pauling’s colleagues cautiously recommended to Caltech president Robert Millikan that Pauling be installed as interim chair of the department. Millikan agreed and offered the position to Pauling, but was met with refusal. At the time of the proposal, Pauling was the object of some degree of criticism within the ranks at Caltech – certain of his peers felt him to be overly ambitious and even reckless in his pursuit of scientific advance – and the suggestion that Pauling assume division leadership was hardly unanimous. Millikan’s terms likewise did not meet with Pauling’s approval; in essence he felt that he would be burdened with more responsibility but would not gain in authority. The impasse would not last long however, as Pauling would eventually accept a new offer in April 1937 and begin a twenty-one year tenure as division chief. A busy year started off with a bang when the sixty-year-old Pauling was chosen alongside a cache of other U.S. scientists as “Men of the Year” by Time magazine. By this period in Pauling’s life his peace activism was a topic of international conversation and early in the year Linus and Ava Helen followed up their famous 1958 United Nations Bomb Test Petition with a second “Appeal to Stop the Spread of Nuclear Weapons,” issued in the wake of nuclear tests carried out by France. As a follow-up, the Paulings organized and attended a May conference held in Oslo Norway, at which the attendees (35 physical and biological scientists and 25 social scientists from around the world) issued the “Oslo Statement,” decrying nuclear proliferation and the continuation of nuclear tests. 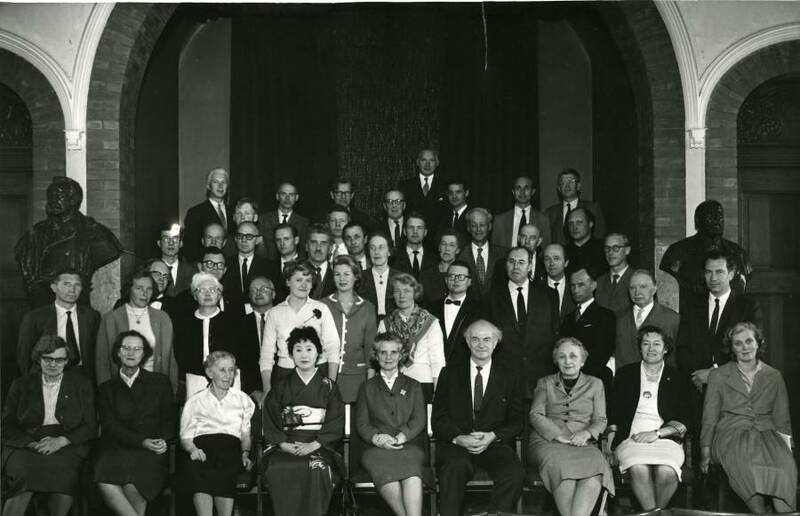 Group photo of participants in the Oslo Conference, 1961. While Pauling’s attentions during this period were increasingly drawn to his peace work, he did make time for innovative scientific research. Of particular note was his theory of anesthesia, published in July in the journal Science. Pauling’s idea was that anesthetic agents formed hydrate “cages” with properties similar to ice crystals. Owing to the nature of their molecular structure, these cages would impede electrical impulses in the brain, thus leading to unconsciousness. In a review article published one year later, the pharmacologist Chauncey Leake described the theory as “spectacular,” though for reasons that are still unclear it failed to gain traction with the larger scientific community. By age eighty-five, Pauling’s interests centered largely upon his continuing fascination with vitamin C. Having already published monographs focusing upon ascorbic acid’s capacity to ward of the common cold and the flu, Pauling was ready to put his thinking together into a general audience book that would discuss the path to happier and healthier lives. The result was How to Live Longer and Feel Better, a modest critical and commercial success that helped bolster the reputation and the finances of the struggling Linus Pauling Institute of Science and Medicine. Pauling was now advising between 6 and 18 grams of vitamin C per day, plus 400-16,000 IU of vitamin E (40-160 times the RDA), 25,000 IU of vitamin A (five times the RDA), and one or two ‘super B’ tablets for the B vitamins, along with a basic mineral supplement. This staunch belief in the value of megavitamins would stay with Pauling until his death eight years later, in August 1994. 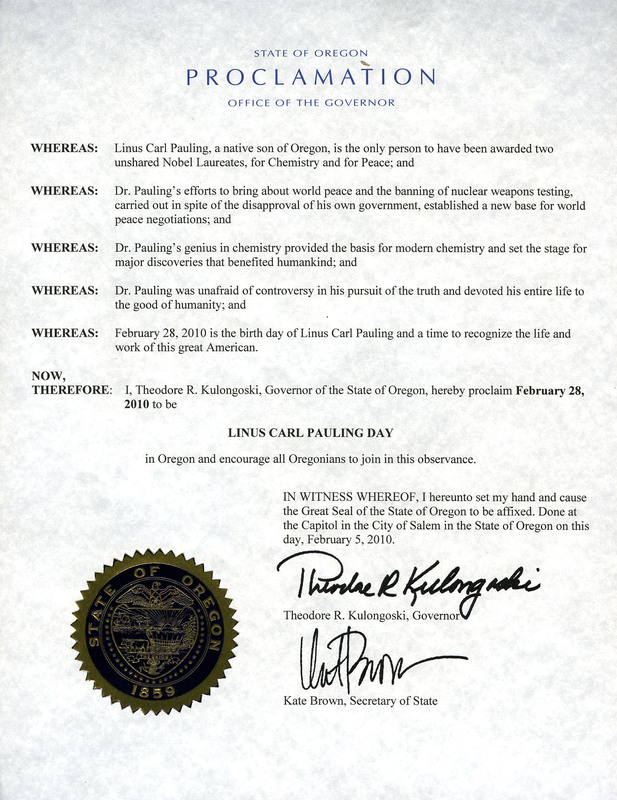 One-hundred and nine years ago, on February 28, 1901, Linus Carl Pauling was born in Portland, Oregon to parents Herman and Isabelle Pauling. 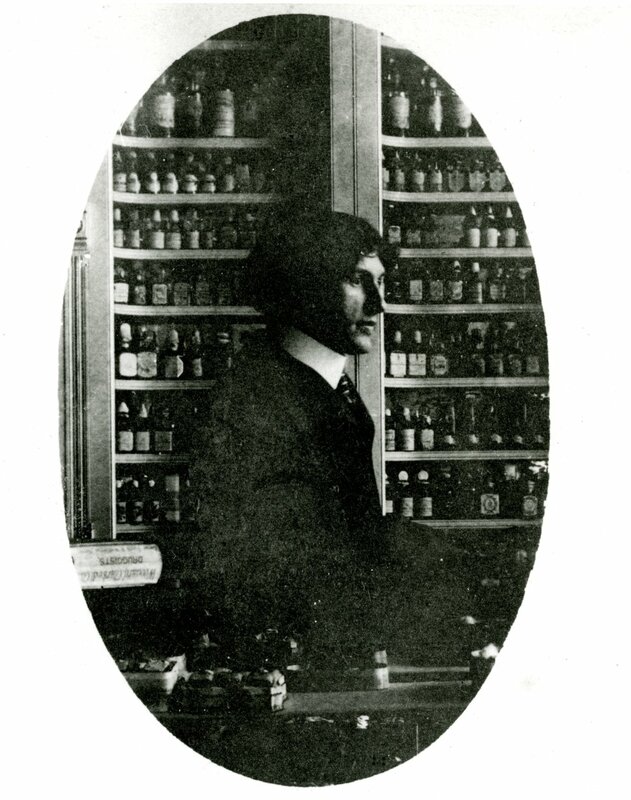 Herman Pauling in his drugstore, early 1900s. In early 1910, the Pauling family moved to a suburb in East Portland. 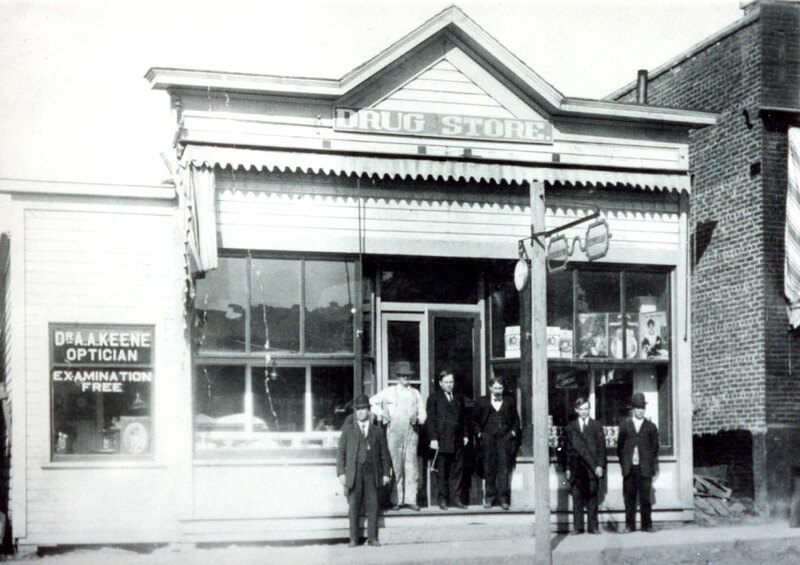 The move was precipitated chiefly by the destruction of Herman Pauling’s drugstore business in Condon, Oregon. His store had been subjected to a number of difficulties before being severely damaged by fire. Herman expended a great amount of energy building a new life for his family, subjecting himself to large amounts of stress in the process. After settling into their new environment, he wrote a letter to the Portland Oregonian in May of 1910, requesting advice for his son. Young Linus Pauling was particularly interested in ancient history at that time, and Herman wanted to a few suggestions on comprehensive texts to indulge his son’s new fascination. A reply from the editor recommended Plutarch’s Lives, Thomas Arnold’s History of Rome, as well as a sampling of Herodotus. The editor suggested that when Linus was finished with these texts, he would no longer need further guidance. A month before the letter was written, Linus Pauling’s maternal grandfather, Linus Wilson Darling, had died from a “valvular disease of the heart.” The following June, only a month after requesting the Oregonian‘s advice, Linus’ father passed away suddenly at the age of thirty-three, a day after falling ill. The official cause was gastritis, though it is very likely that stress was a major contributor. Linus quietly accepted the news of his father’s passing. Though he was calm and controlled on the outside, one can easily imagine the emotions being kept in check within. This suppression of emotions, and his ability to carry on under difficult circumstances, would prove to be both an asset and a liability for Pauling throughout his life. Though the event was likely the beginning of his inability or unwillingness to deal with unpleasant events and circumstances, it would not last forever. Eventually, Pauling would be forced to deal with these demons. The death of Linus’ father utterly destroyed the life that the Paulings had known. The family was in a new town, the three children were attending new schools, and the family’s main source of income was gone. Linus’ mother Belle attempted to keep the family business in operation, but had the children to care for and no previous business experience. She was eventually forced to sell Herman’s new store and invested the proceeds into a boardinghouse that would provide the family with a home, and a chance to draw a dependable monthly income. Understandably, Belle herself was not handling the stress well. In two months she had lost both her husband and father, and was forced to become the family’s sole provider. She fell into a deep depression and succumbed to a chronic illness from which she would never recover. After coping with her initial grief, Pauling’s mother attempted to maintain some scrap of the normality that the family had previously known. In the period immediately following his father’s death however, Linus and his sisters were allowed to “run wild” with little to no supervision from their mother. Belle was unable or unwilling to cope with her new responsibilities and eventually became cold and practical in order to deal with her life’s harsh new realities. She initially hired a woman to help around the house, but was eventually forced to let her go as money grew tighter. Linus and his sisters were expected to do a number of chores for the boardinghouse and eventually compelled to seek outside employment. As would happen again to Pauling later in life, the wages from their jobs were completely utilized by Belle to supplement the family income. To deal with the unpleasantness that this new arrangement brought to young Linus, he retreated into himself and into books. He absorbed all of the household reading material, and eventually discovered the local public library. A small bit of additional comfort was provided to Linus when school resumed the following Fall. He found that by doing well in school, he could receive some of the respect and acknowledgment that was lacking at home. For better or worse, it is likely that 1910 most directly shaped the constitution and trajectory of Linus Pauling’s life. Had Linus’ father not passed away, and had he been afforded a stable life of relative comfort, it is difficult to guess what Pauling might have done with his abilities. The tragedies and uncomfortable necessities that plagued Pauling throughout his childhood and adolescence were likely among the motivating factors driving the great man’s success. Had this year been different, Linus Pauling, renowned for his contributions to science, activism and nutrition, may well have applied his energies in a dramatically different manner. For much more on Linus Pauling’s early years, check out our Oregon 150 series of posts. Main Street, Condon, Oregon. August 2009. Herman Pauling’s pharmacy building, written about here, no longer exists. In its place is a lovely little park. Former location of Herman Pauling's drugstore. 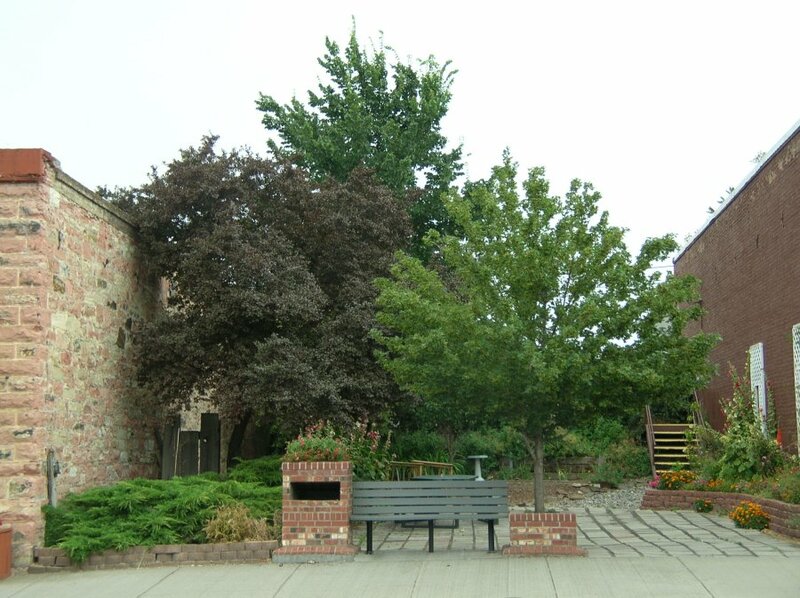 Now a park on Main Street, Condon. 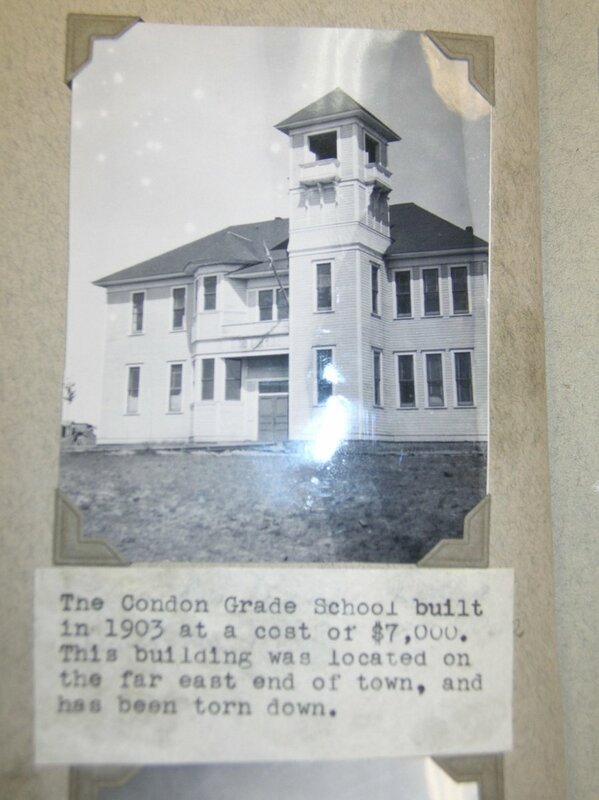 Gone too is Pauling’s first school – the Condon Grade School built in 1903. Condon Grade School, built 1903. 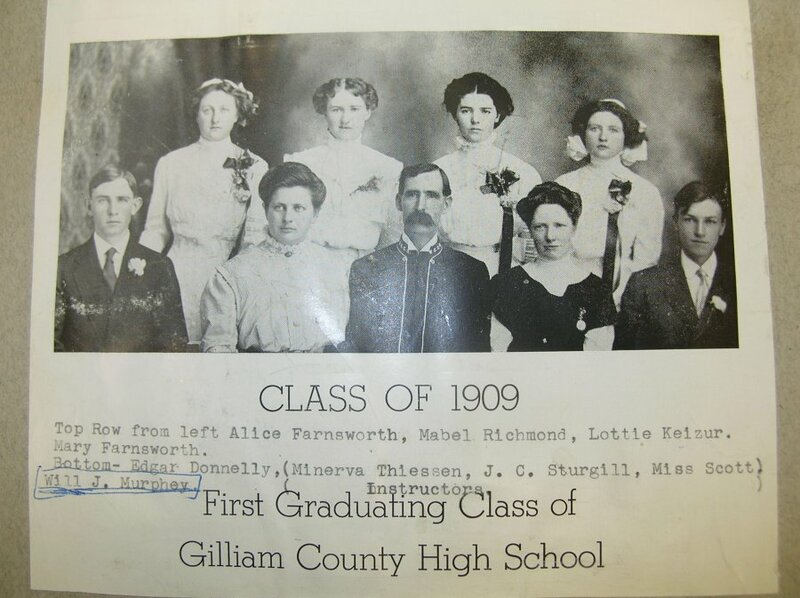 Photo courtesy of the Gilliam County Library. 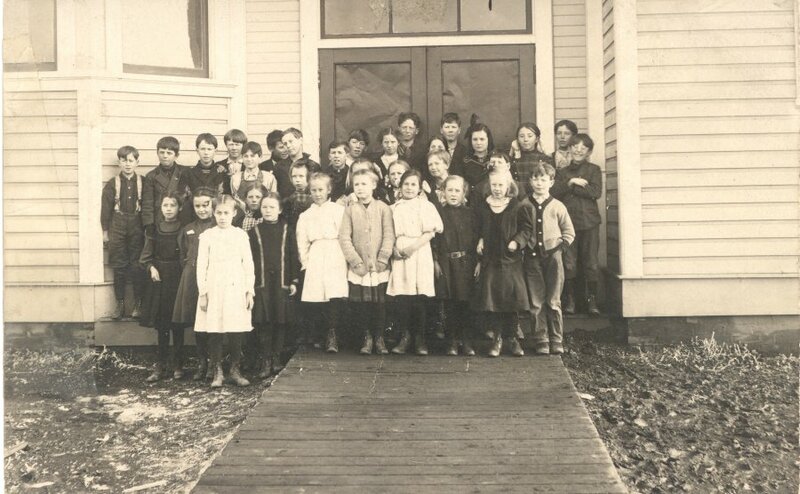 Linus Pauling (far right) with his Condon elementary classmates, 1909. We had known about Pauling Field at the Condon State Airport, but this was our first glimpse. Pauling Field, Condon State Aiport. 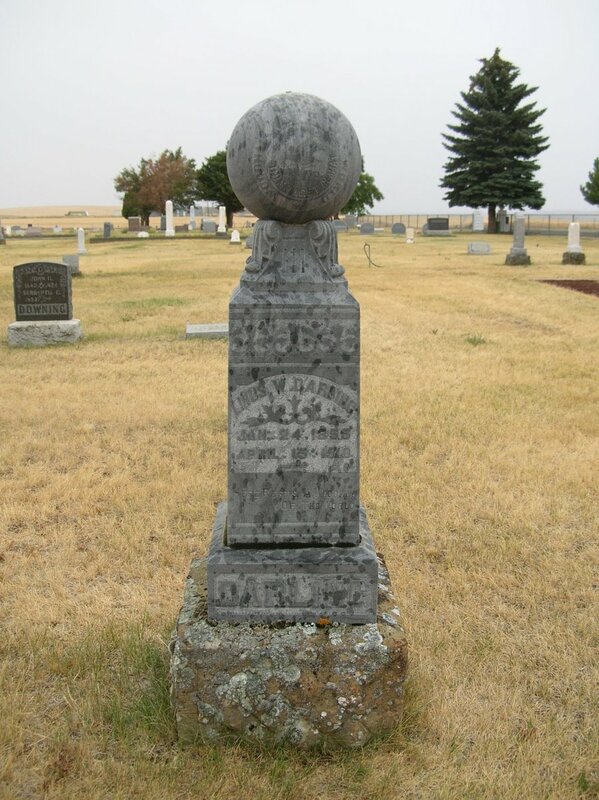 We had also known about Linus Wilson Darling’s (Pauling’s maternal grandfather) grave, which is located at the Condon City Cemetery, but did not realize that he was buried next to Florence Darling, one of his six children, a toddler who died twenty-two years before her father at the age of two. Linus Wilson Darling's marker, Condon City Cemetery. 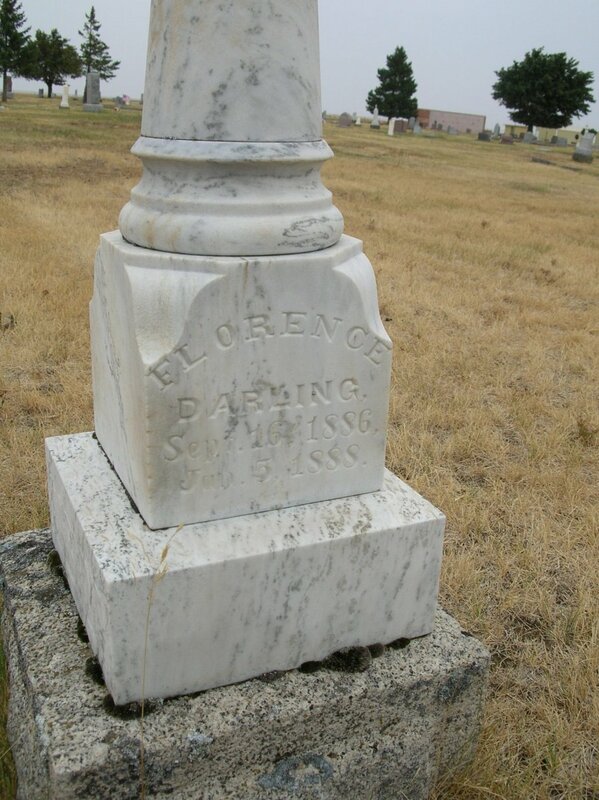 Grave of Florence Darling, Condon City Cemetery. Close inspection of L. W. Darling’s marker indicates that he was very proud of his fraternal memberships – the plaque notes that “Here Rests a Woodman of the World” and elsewhere bears a symbol of the Knights of Pythias. And though most of the marker has not been restored, the spherical stone at its peak appears to have been turned to a more symmetrical position, at least when compared with this 1988 photo. 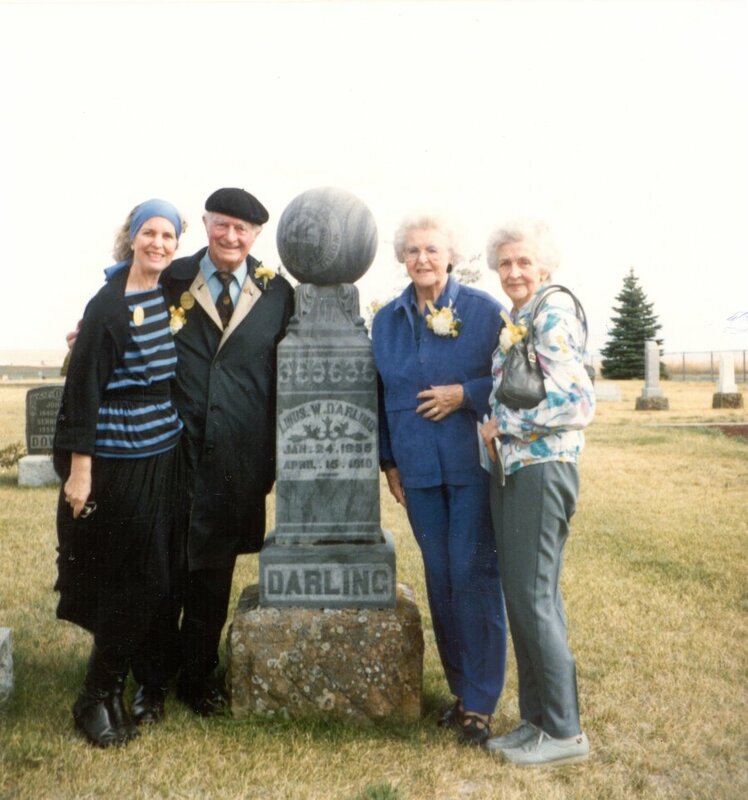 Linda Pauling Kamb, Linus, Pauline and Lucile Pauling at the grave of L. W. Darling, Condon, Oregon. 1988. Our trip to Condon was rendered decidedly more fruitful by a visit to the terrific Gilliam County Historical Society museum which features, among other artifacts, an antique bicycle-powered jigsaw. 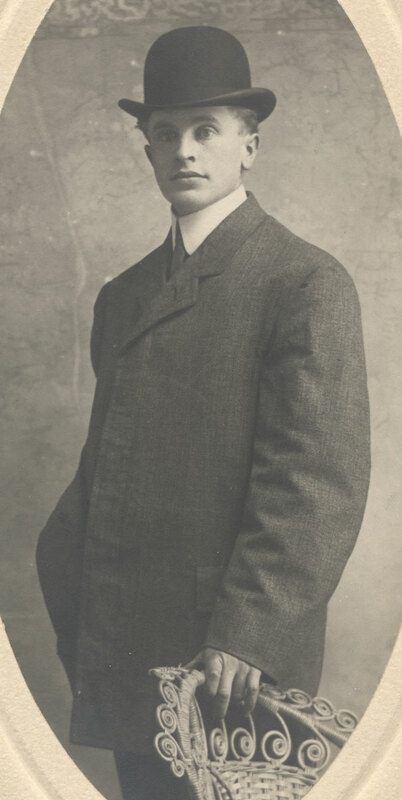 The society’s collections also include a few very rare images of William P. Murphy (Condon’s “other” Nobel Prize winner) who, as it turns out, was a member of Condon High School’s first graduating class in 1909. The Condon High School class of 1909. William P. Murphy (incorrectly identified as Will J. Murphey) is seated at the far right. 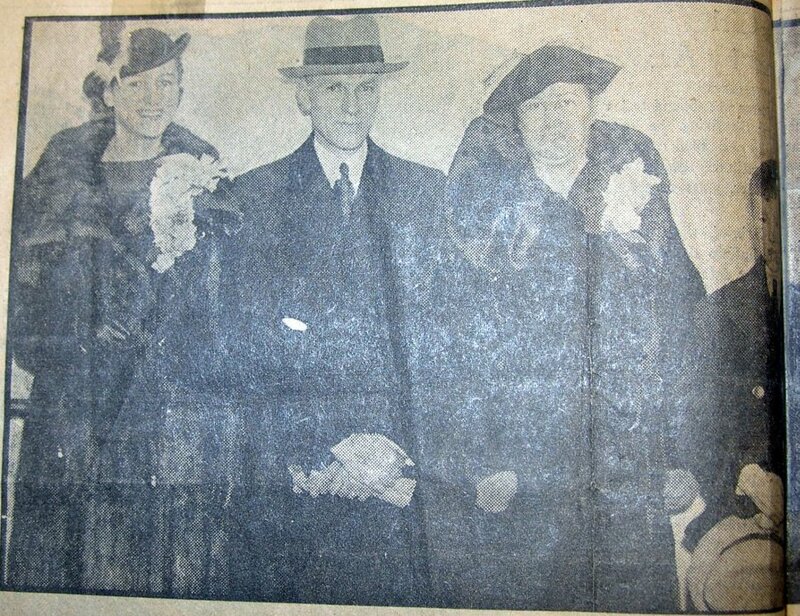 Here’s an Oregonian image of Murphy and his family as they set off to Sweden for the Nobel festivities in 1935. William P. Murphy and family en route to Sweden. Image first published in the Sunday Oregonian, July 21, 1935. The Historical Society’s Pauling-related collection includes a fabulous vertical file of stories that appeared in the local media throughout the years. One such article, written in 1969 during Pauling’s trip to Corvallis for the centennial celebration of Oregon State University, recounts many of the more interesting details of Pauling’s colorful family history. All the Darlings were highly intelligent people, although some had quite a percentage of oddity. W. L. Darling, ‘Bill’ a brother of L. W. Darling, was a paper hanger and a painter. He was also a confirmed spiritualist. His control was an Indian named ‘Red Cloud.’ Chatting with the spirits was an every evening affair with Bill. He was trying to get the spirits to tell him the location of the lost gold mine in the Lonerock Country. Pauling’s aunt Stella Darling was a safe expert. She could open any safe and had a national reputation. She once traveled to London, England to open a safe. The vertical file likewise includes documentation of various births, weddings and deaths, most of which are written with a great deal of local flavor. 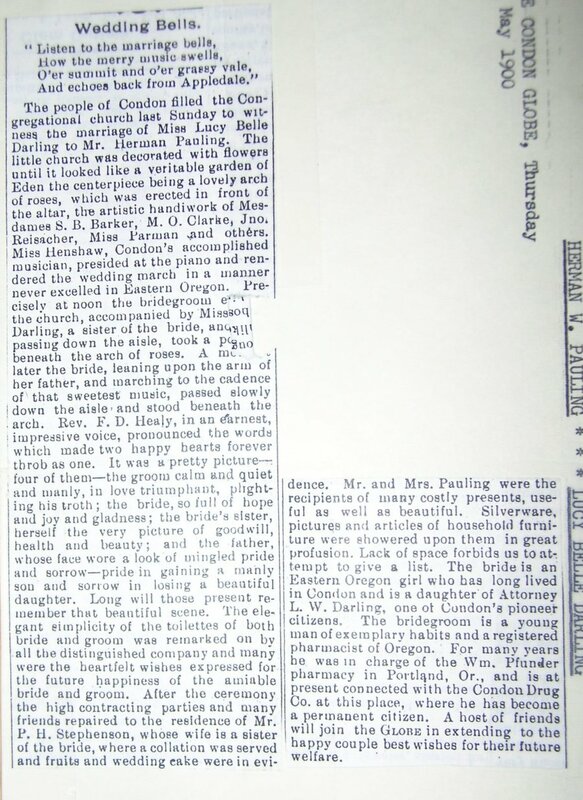 Announcement of Herman Pauling's wedding to Belle Darling, Condon Globe, May 1900. 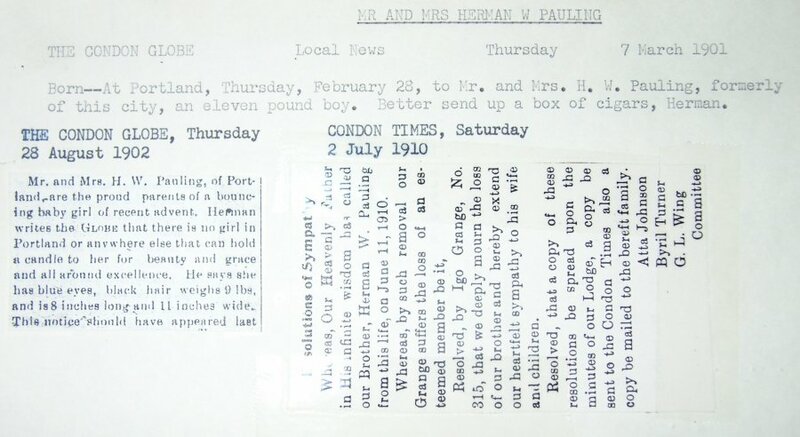 Announcement of the births of Linus and Pauline Pauling, and the death of Herman Pauling. Condon Globe and Condon Times, 1901, 1902, 1910. 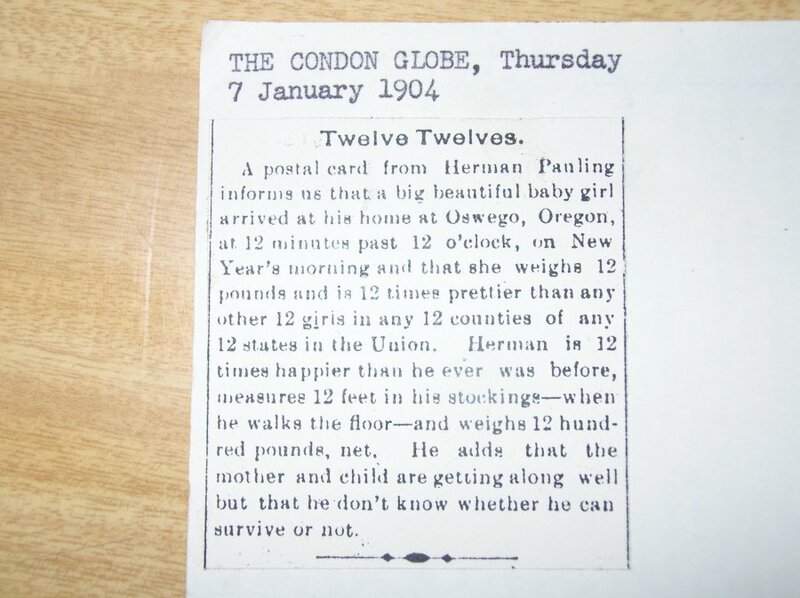 Announcement of the birth of Lucile Pauling, Condon Globe, 1904. 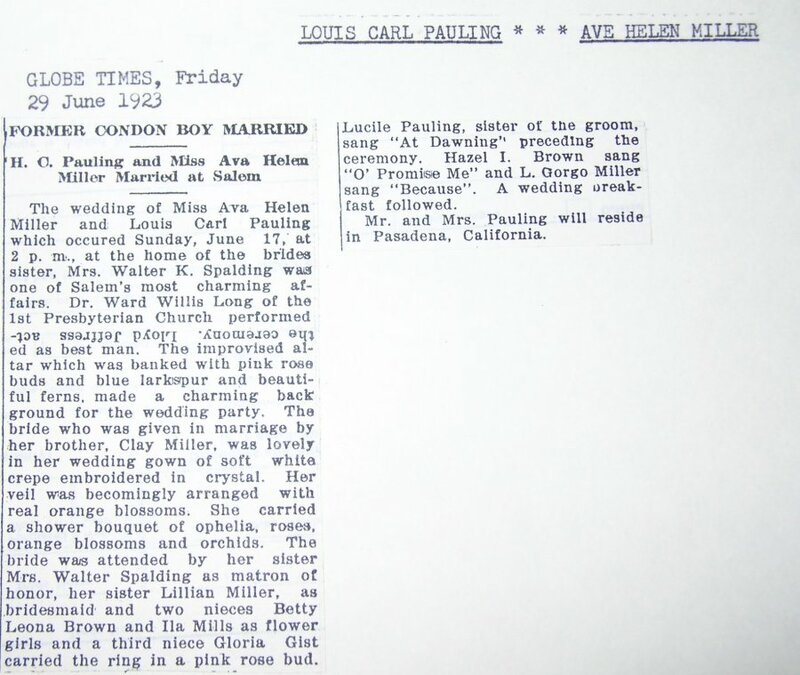 Our favorite item though, is this announcement of the marriage of either H. C. Pauling or Louis Carl Pauling to Miss Ava Helen Miller, as reported in the Condon Globe Times on June 29, 1923. Note, in particular, the flipped ninth line of the first paragraph – part of the cost of doing business during the era of handset news type. "Former Condon Boy Married," Condon Globe Times, June 29, 1923. 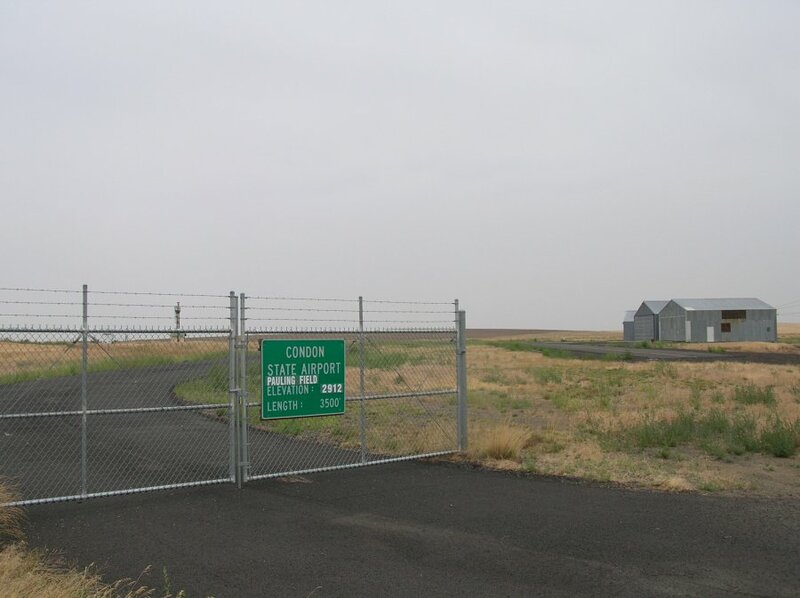 Condon is not an easy place to access – it was built to serve the needs of area farmers and is nowhere near a major highway. Our afternoon in the town was, however, defined by the kind of small-town hospitality that would seem a cliché were it not so genuine. We’re already planning a return visit. 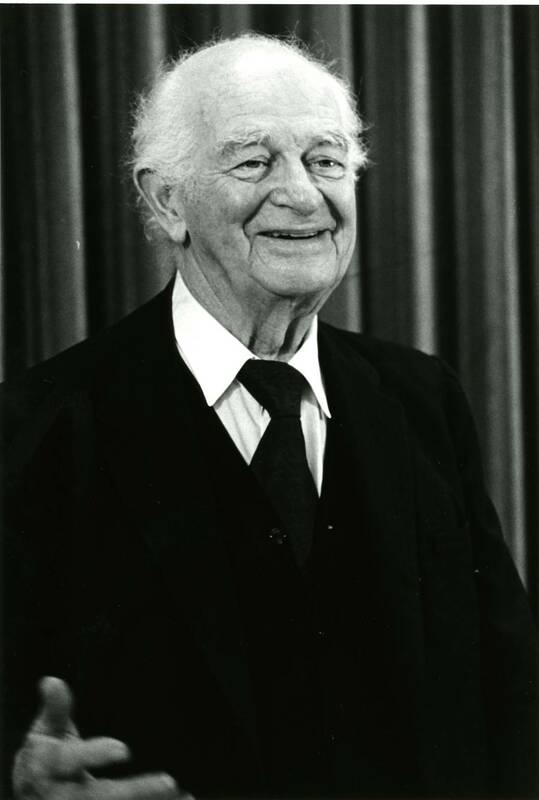 For more stories of Linus Pauling’s life and times in Oregon, see our continuing series commemorating the Oregon150 celebration or visit the Linus Pauling Online portal.